Delaware County Health Comissioner Shelia Hiddleson presents the Delaware County 2019-2022 Community Health Improvement Plan Friday morning at SourcePoint in Delaware. The Partnership for a Health Delaware County outlined its community health goals through 2022 during its presentation Friday of the Delaware County Community Health Improvement Plan (CHIP). 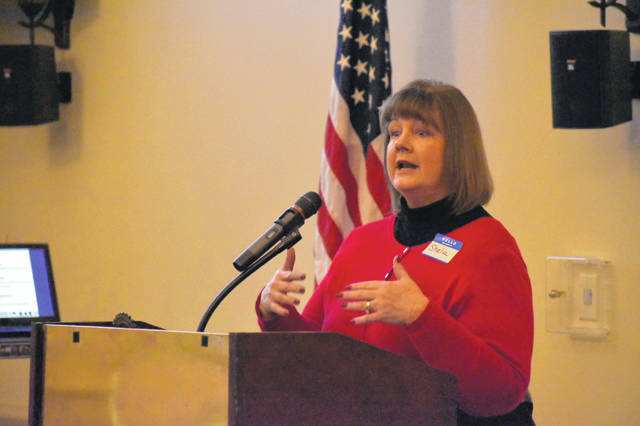 Shelia Hiddleson, health commissioner at the Delaware General Health District, gave an overview of the CHIP in SourcePoint’s Radebaugh Room, where she said the overall health outcome goals are to increase health status in the county and decrease premature death. Hiddleson said the plan used assessments to determine specific health issues, and the priority topics are mental health and addiction, and chronic disease. • reduce unintentional drug overdose deaths. To this end, Hiddleson said the plan calls for organizations and partnerships in the county to implement school-based suicide awareness and education programs, school-based violence prevention programs, and school-based alcohol/other drug prevention programs. The plan also calls on the county to utilize suicide crisis hotlines and cell phone-based support programs, and screen for clinical depression in juveniles 12 and over. It also calls for partnering with schools to provide prevention programming that supports positive mental health. To combat addiction, the plan calls for expanding community-based comprehensive programs to reduce alcohol abuse, and increasing safe disposal locations for prescription drugs. Hiddleson also discussed the plan’s goal to combat chronic diseases. She said the plan focuses on decreasing diabetes and heart disease. To combat diabetes, the plan calls for the partnership to offer diabetes risk assessments and questionnaires to patients so their physicians can learn if they are at risk. The plan also calls for community-based social support for exercise. According to the plan, the initiative would build, strengthen, and maintain social networks that would encourage positive behavior changes. Examples include setting up walking groups, exercise buddy systems, or physical activity plans with others. The plan also calls for research into chronic pain management best-practices that aren’t addictive prescription drugs. The cross-cutting strategies listed in the plan include increasing the amount of affordable housing; providing cultural competence training for health care professionals and other service providers; increasing transportation opportunities and awareness; adopting healthy food initiatives and promoting healthy eating practices through education and skill building. “There’s a lot of work going into this,” Hiddleson said during her presentation. She added the problems discussed in the plan came from community feedback. “We take those things seriously that they said were important to them,” Hiddleson said. She said community members looking to help make the county healthier can start by focusing on their own health. More information about the plan and partnership can be located at https://delawarehealth.org/partnership-for-healthy-delaware/.